Econometrics By Simulation: Who are Turkopticon's Top Contributors? In my most recent post "Turkopticon: Defender of Amazon's Anonymous Workforce" I introduced Turkopticon, the social art project designed to provide basic tools for Amazon's massive Mechanical TURK workforce to share information about employers (requesters). Turkopticon, has a been a runaway success with nearly 285 thousands reviews submitted by over 17 thousand reviewers since its inception in 2009. Collectively these reviews make up 53 million characters which maps to about 7.6 million words as 5 letters per average word plus two spaces. At 100 words every 7 minutes this represents approximately 371 days collectively spent just writing reviews. It is probably safe to considered this estimation an underestimation. So given this massive investment of individuals in writing these reviews, I find myself wanting to ask, "who is investing this kind of energy producing this public good?" In general, while there are many contributors, 500 contributors represent 54% of the reviews written. With the top 100 reviewers making up 30% of the reviews written and the top 15 representing 11% of all reviews written. 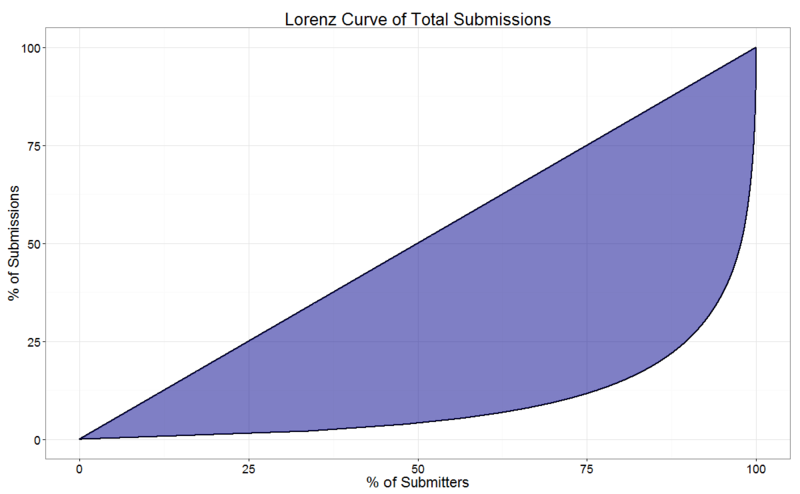 Figure 1: Using this graph we can find the Gini coefficient for number of submissions at around 82% indicating that a very few individuals are doing nearly all of the work. Within Turkopticon there is no ranking system for reviwer quality so it is not obvious who are the top contributors and what their reviewing patterns look like. In this article we will examine some general features of the top contributors. Table 1: A list of the Top 15 Turkopticon review contributors. Rank is the reviewer rank by number of reviews written. Name is the reviewer's name. Nrev is the number of reviews written. DaysTO is the number of days between the oldest review and the most recent review. Nchar is the average number of characters written in each review. FAIR, FAST, PAY, and COMM are quantitative scales that Turkopticon requests reviewers rank requesters by. Fair indicates how the requester was at either rejecting or failing to reject work. Fast indicates how quickly the requester approved or rejected work. Pay indicates how the reviewer perceived the payment scheme for work was. And Comm refers to communication which indicates, if the worker attempted to communicate with the requester, how well that requester addressed the worker's concerns. Find the full list as a google document here (First Tab). From Table 1 we can see that all of the top 15 reviewers have contributed over 1,200 reviews with bibytes being the most prolific reviewer contributing over 52 hundred. In terms of the reviewer active on Turkopticon the longest, NurseRachet (a forum moderator) has been on the longest followed by worry and Rosey. In terms of the longest winded kimadagem has the longest average character count per review at 490 characters or approximately 70 words per review while CaliBboy has the shortest reviews at only 75 characters or around 10 words. In terms of the averages the four rating scales there is a fair bit of diversity between the top reviewers with jaso...@h.. having the highest average score between the four scales of 4.8 and jmbus...@h... having the lowest average scores, around 2.7 followed by ptosis with a average a tiny bit higher than 3. So now we have a pretty good idea of what in general the top contributors to Turkopticon look like. But what of the quality of the contributions? In order to understand what a quality contribution in Turkopticon looks like we must consider the standards that the community has come up with after years of trial and error. 1. The four different scales should be distinct categories. That is a high pay rate should not cause someone to automatically rank a high Fairness or visa versa. 2. To this end what is referred as 1-Bombs an attempt to artificially drop a requesters score by ranking all scales 1 should be avoided. Similarly, 5-Bombs should also be avoided. 3. Within Turkopticon there is also the ability to flag reviews as problematic. If one of your reviews is flagged, it means someone has a problem with it. 4. In general we would like reviews to be approached with a level head so that reviewers write independent reviews rather than ones based on their current mood. 5. Finally, in general we would like reviewers to review as many categories as they can when writing reviews. From these 5 guidelines, I will attempt to generate variables that measure each of these targets. 1. For different scales I will focus on the relationship between pay and the other three scales for individual requesters (FairPay, FastPay, and CommPay for the correlations between Fair, Fast, and Comm with pay respectively). The reason I focus on Pay is that it seems to be the scale often times that concerns Mturk workers the most. Table 2: For reviewers the average correlation between Pay and other scales. From Table 2 we can see that the average reviewer has a very strong positive correlation between Pay and the other scales with FAIR, FAST, and COMM in the .73-.81 range. In contrast the Top 100 and especially the Top 15 all have much lower correlations. We should not necessarily hope for a zero correlation between these factors since one might expect a requester who pays too low might also act unfairly, not respond quickly to submissions, or have poor communication habits. 2. 1-Bombs and 5-Bombs are easy to observe in the data in terms of all 1s or all 5s. However, it is worth noting that all of either 1s or 5s might actually be a valid review given the circumstances. Variables 1Bomb and 5Bomb will be a variable measuring the likelihood that an individuals review will be either of the two categories. 3. Flags are also a variable that can be directly observed. Multiple flags can be featured on a single review. The highest flag hit in my data has 17 flags. The variable FLAG is the average/expected number of flags for an individual reviewer's reviews. Table 3: The prevalence rates of 1-Bombs, 5-Bombs, and Flags. From Table 3 we can see the prevalence rates of 1-Bombs, 5-Bombs, and Flags is much higher among the general reviewers than that of the Top 100 and especially among the top 15. 4. In order to attempt to measure "level-headedness" I will just look at how reviews trend from a rating perspective. That is, is the value of the current review correlated (either positively or negatively) with the value of the next review? Table 4: The auto-regressive one step correlation between review levels. In this case the "ALL" category only includes the 3,700 reviewers who have written more than 10 reviews. From Table 4 we can see that inter-review correlation is pretty small especially when compared with the correlation between pay and other scales within the same review (Table 2). Interestingly for the average reviewer, there is almost no correlation across reviews. This might be a result of reviewers writing less reviews in general, thus spacing them more widely and therefore less likely to be sequentially influenced by personal psychological trends. 5. Finally in terms of completeness we can easily measure completeness in terms of how frequently reviews of individual scales were not completed. Table 5: The completion rates of individual scales. From Table 5 we can see that the completion rates of all scales are more or less equivalent between that of the general reviewers and that of the Top 100 and Top 15 except in the case of COMM. In this case we can see that the top reviewers are much less likely to rate communication. In order to construct the best scale given our data, we will choose those variables and values that seems to typical of the top 15 most prolific reviewers. From Tables 2 and 3 we can see very distinct differences between the average reviewer and top reviewers. However, for our auto-correlation and completeness rates we see very little differences in general except that the top reviewers are much less likely to rate communication. I can't know exactly why this is the case but I suspect it is a combination of top reviewers avoiding 1-Bombs and 5-Bombs perhaps in combination with top reviewers finding it not typically worth their time to directly communicate with requesters. Because we have standardized the coefficients we can read the scalars in front as directly representing the weight of that variable. Flags, I will weight the strongest as they are an indicator that someone in the community has a problem with the review. Next highest rating are 1Bombs which are widely regarded as a serious problem and frequently discussed on the Turkopticon forum. 5Bombs, FAIRPay, FastPay, and CommPay are also discussed but not considered as important (Turkopticon Discuss). I have caused the 5Bombs to be half as important as FairPay, FastPay, and CommPay variables as it seems cruel to penalize someone for being generous with reviews. So let's apply our index and see how our top 15 reviewers score! Table 6: The top 15 most prolific contributors ranked based on the ReviewerProlemIndex (Index, RPI). IRank is the ranking of reviewers in terms of the RPI. Name is reviewer name. Nrev is the number of reviews written. Rank is the reviewers ranked in terms of number of reviews written. The other variables are described above. From Table 6 we can see that in general the more prolific reviewers also tend to be higher ranked on the RPI with a few exceptions. One exception is "jmbus", despite being the fourth most prolific contributor he/she is ranked at the bottom of the top 15 contributors list. This is likely due to having the highest 1-Bomb rate of the index with 17% of reviews being 1Bombs. His/her reviews also seem to be almost entirely correlated with Pay as FairPay, FastPay, and CommPay are all correlated upwards of 90%. Similarly, "jessema" though only being the 9th most prolific reviewer seems to have the highest quality of reviews (slightly ahead of "kimadagem") with very low Flag, 1Bomb, and 5Bomb rates as well as very low correlation between the scales Fair, Fast, and Comm with that of Pay. Interestingly, though both "Thom Burr" and "Rosey" have very high correlation rates between Pay and the other scales, because the have relatively low Flag, 1Bomb, and 5Bomb rates they are ranked near the middle. Overall, except for a few exceptions, I am very impressed that the top contributors seem to score so well on the RPI index. Table 7: The Top 100 most prolific contributors ranked based on the Reviewer Problem Index (RPI). Find the full list of Top 100 ranked here (Second Tab). In Table 7 we can see how reviewers score on the RPI across all of the Top 100 reviewers. The Top 10 have great scores with SERI having the top ranked score with over 488 reviews written and no Flags or 1Bombs and only three 5Bombs. For SERI there is also no correlation between Fair or Comm with an amazingly negative correlation with Fast. The worse 10 reviewers is much more interesting mostly due to tainturk a Turkopticon moderator and Tribune a former moderator being on the list. Everybody on the worse 10 list suffer from very high correlations between the other scales and Pay. Tainturk though also suffers from having 50% of his/her reviews being 1Bombs (for those reviews in which all of the scales were completed). This is not the worse as Taskmistress has 75% 1Bombs but this was surprising. Looking back at the early reviews I see that 1Bombs seem to be common earlier in Turkopticon and are intended to reflect a Amazon Terms of Service violation, something that has since been implemented. Similarly Tibune has one of the highest flag count rates in the entire list with an expected numbe rof flags of 5% on his/her reviews. However, as Tribune was invited to be a moderator despite this spotted history, we can only assume that my rating system has some serious flaws. Overall, I would therefore take the RPI ranking with a grain of salt. Perhaps some of the longer time contributors to Turkopticon are suffering from changing standard over time. If I have time I will revisit the rating system looking at only reviews within the last year or two. I'm just wondering if you calculated "DaysTO" as it sounds - from the first review posted to the last, or if this is total days posting to TO? I ask this because it says my DaysTO are 669 when actually it has been 1447 days between my first and last review. I am not remembering right off the top of my head as this was a few months ago, but I think that it is the number of posts. I can look up the code if you would like.